I accidentally missed my favorite "every so often" series on Saving Throw on Friday. But, luckily, I stumbled upon a multi-part on Tempting Fate using Lasers & Feelings called Into the Spiderverse! Oh yeah. I'm there! I watched part 1 to get ready and then joined live for part 2 on Twitch tonight. I subbed at the beginning of the show and gave my re-roll to the table (Hey, I'm a Hufflepuff. I am for the people). Into the Spiderverse has been AMAZING so far, and I'm excited to find out what's going to happen next. I mean, we've got Peter Pupper, the Spider-dooooge, and Squeaker Parker, a Spider-mouse. And that doesn't even cover the genderbending and the songs and queer characters and an appearance from Shuri and ALL THE SPIDERVERSE VARIATIONS! Everyone has been so wonderfully creative so far with the characters and the story. I started reading it in October, but finally finished this book today: Witches: The Absolutely True Tale of Disaster in Salem by Rosalyn Schanzer. 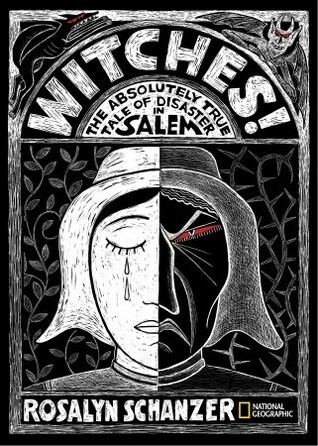 I enjoyed the historical, fact-based telling about Salem, free of embellishment and speculation. I've been to Salem a few times, but I still learned quite a lot from this book.